I discovered recently when playing with the latest version of Microsoft Office 2013 that it had a template called Blog post which apparently allows you to post news articles directly to popular blog software. 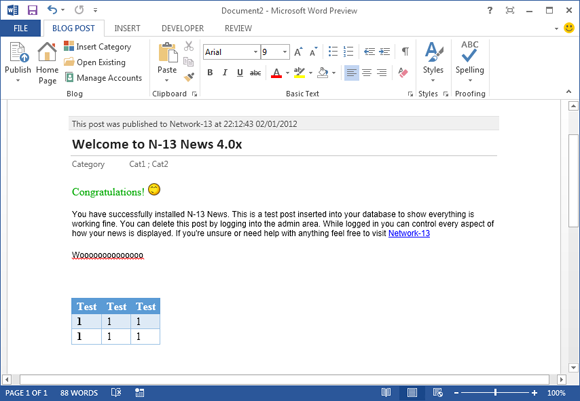 After a bit of investigating I decided I could write a script to allow articles to be posted directly to any N-13 News installation. Extract the 4 files and copy them to your server into the same directory you installed N-13 News. 2 - Edit the xmlapi.php file, towards the top of the file are a few settings, edit these to match your own server settings. These instructions apply for Microsoft Word 2007 and above. 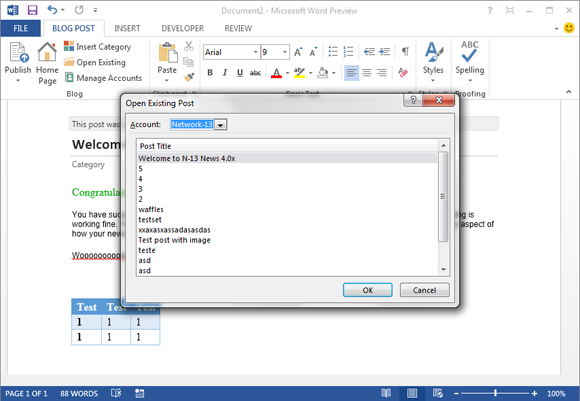 To open the Blog post template, navigate to File > New > and find the Blog post template. Once you've opened it it may ask you to add new account, if it doesn't, select the Manage Accounts option. 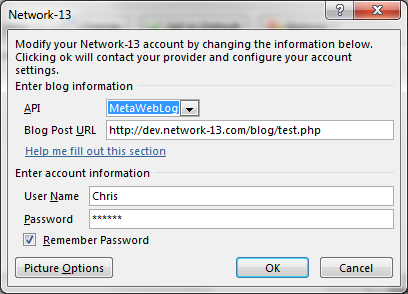 The username and password is the same username and password you use to login to N-13 News. Once you add the account, hopefully that should be all that's required. Now you should be able to open existing articles on your server and publish new ones. Many thanks to Ryan Hemelaar who wrote the basis of the code I built on top of.